Sooooo … remember many months ago when it was announced that Sacha Baron Cohen would appear in a movie called The Lesbian? Well, that’s still happening. And Baron Cohen has gone all the way to Denmark to get the screenwriters for it. Baron Cohen has tapped the screenwriters of the Danish film Klown to work on the screenplay for The Lesbian. There’s already a treatment written by Baron Cohen and Ant Hines, who also did Borat and Bruno, so we can assume that the new guys Casper Christensen and Frank Hvam will be working off of those ideas. The Lesbian is the true story of Hong Kong billionaire Cecil Chao who offered $65 million to any man that could ‘convert’ and marry his lesbian daughter. The daughter’s rather unpredictable reaction to this was to be moved by how much her father cared about her. It’s just … such a lovely story, isn’t it? It’s certainly a story that one would imagine appeals to the man behind The Dictator and Borat. I assume that Baron Cohen has intentions to play the Hong Kong billionaire in this scenario, given his penchant for combining offensive stereotypes with some pretty biting satire. But we will have to wait and see on that. Klown, by the way, is a 2010 Danish film about a man who kidnaps his pregnant girlfriend’s 12 year old nephew and takes him on a canoe trip, in a bid to prove his potential as a father. It has been compared to The Hangover – and low and behold, Todd Phillips is actually planning to film an American remake of it, with Danny McBride in the lead. Natural choices for a script of The Lesbian, methinks. 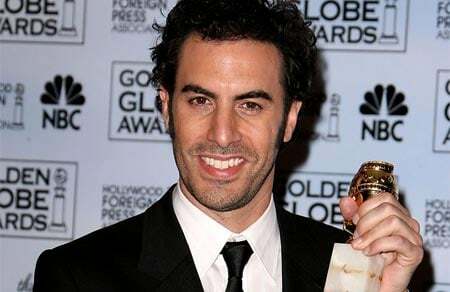 At the end of the day, though, The Lesbian is going to be all about Sacha Baron Cohen and whether or not he can bring the funny (as in Borat) or not (as in Bruno). Only time will tell.